I have been on dry land now for about a week and I must say I find it very pleasant. I have been very focused on eating and sleeping… as I give in to all the pent-up cravings from six months at sea. I began in Newport with the famous “HackyBurger”- a bacon cheeseburger with a fried egg, LTM and lots of mayo- seriously decadent and delicious. Delicacies like ice cream and steak and wine have been inhaled. I got on the scale a few days ago and was at 175 lbs- my college playing weight, although somewhat re-distributed- after starting the trip at 184- but I think I was much skinnier in the Southern Ocean and put pounds back on in the Atlantic. I think I’ll start my new physical fitness regime… uhmmmmm… tomorrow! Thank you to all of you who attended the reception in Newport last Thursday and to those who have sent along notes of congratulations- very much appreciated. Thanks to SailNewport and Newport Shipyard for hosting. I am sifting through various email accounts and Facebook posts so will try to get back to many of you who have reached out. 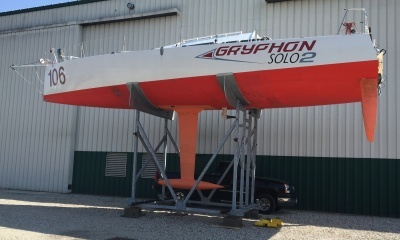 I have been focused on getting GS2 properly put away for a bit of rest and she is in her cradle out of the water at Maine Yacht Center (see photo below or on Facebook). Sails are off to the sailmaker for repair, mast is taken apart and inspected and we have really inspected the whole boat and found her to be in excellent shape. In particular, we were all commenting that it is amazing that the wind instruments never blew off the masthead and that there were no running rigging failures- a testament to thorough preparation last year. Get the boat put properly away for at least a two-month rest- maybe longer- also need to decide whether to keep it or sell it. Rob Windsor and I have been talking about doing some training for those interested in short-handed, offshore sailing- providing a custom-tailored curriculum to racers or cruisers wishing to venture safely far offshore. If interested, drop me a line. I would like to resume my career in commercial real estate so will be speaking with friends and former colleagues about acquisition, finance, development or project management work.